I decided to paint our pantry door with chalk board paint. The hubby was skeptical, but he’s learned to trust my home decor ideas. I used chalk board paint to cover our very old and shabby white door. I think it looks so much better now. I have regular chalk and I bought some chalk ink markers that are WAY cool. They wipe away only with water or cleaning wipes. We are using the regular chalk to make daily changes to our board and the markers for the more permanent stuff. So fun and a great idea for an organized family!! Check out all of the great chalk board ideas on google..WOW!! 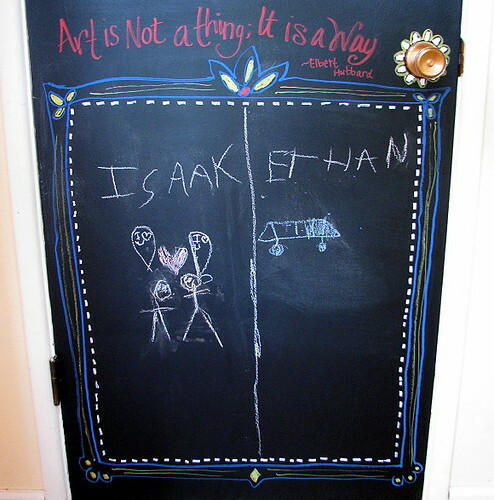 This entry was posted in Family Life, Fun kid stuff, Home Sweet Home and tagged chalk, chalk board, chalk board paint, organizing. Bookmark the permalink. love it! Looking,looking, looking. Do I have any doors i could do that with? Love this! I did a half wall of chalkboard paint in our playroom, and I’m trying to convince hubby to let me paint an entire wall in our oldest’s bedroom. No luck yet! That’s a cool idea although i’m not sure our landlord would approve. Wow, I did this to our pantry door several years ago when we put in bamboo floors. I love it. Before putting on the chalkboard paint I did several coats of metallic paint, thereby creating a combo chalk magnet board. Great way to post the menu and messages. Love your door! 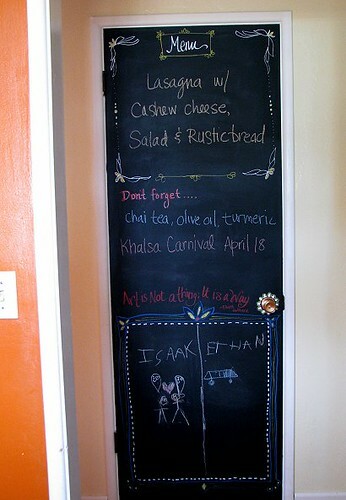 When the kids were small we always had a big chalk board, but never on a door, great idea! Can I just say Yay! to that link for the chalk ink markers. 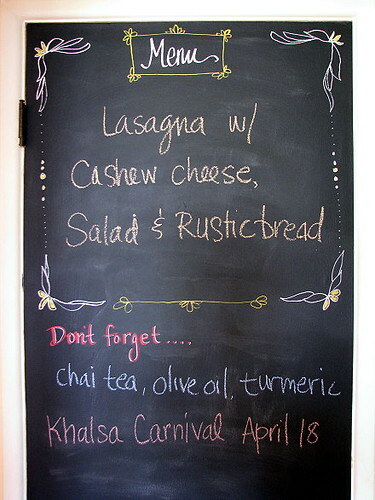 I’ve painted two different chalkboards in my daughters’ rooms and would love to have those. Also, love your pantry door. Very fun. I love chalkboard paint in the kitchen. In my last house I painted all the walls in the kichen with green chalkboard paint. One of the best decor things I ever did. It broke my heart to leave it when I moved. And this vegan wants to be invited over for lasagna with cashew cheese, now we’re talkin’! That sounds great! That is so cute Regina! i’ve been thinking about doing this with a door in my kitchen. Love it! And I need to check out those chalk markers – sounds interesting! that is a great idea! 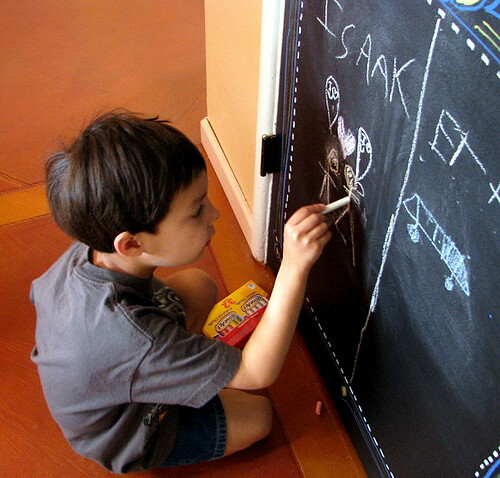 i’ve been leery of using chalkboard paint in the house (chalkdust, etc.) but we too have a smallish shabby pantry door. Hmmmm…. that would probably go better than our magnetic wall experiment. yikes. This is on my list of things to do, but I’m planning on a narrow wall in our kitchen. I can’t wait to get it done! I had to laugh about the “skeptical husband” comment – I get that all the time and sympathize completely! Love the creativeness! I love your pantry door!! I want to do mine, but I’m not sure on what type of paint to use, can you help??? Can’t wait to do this for my child. A very exquisite and creative idea, thumbs up!